As a storm rages around Yukon's Mount Logan, mountain climber Natalia Martinez is hunkered alone near the summit, awaiting a rescue that may not arrive until Friday. Martinez was partway through a multi-day expedition to the top of the peak when a pair of nearby earthquakes set off a series of avalanches that stranded her. The Argentinian is currently camped on a relatively stable ridge, but the potential aftershocks and harsh weather mean that moving up or down the mountain is out of the question. Mount Logan is the highest peak in Canada, towering 5,959 metres within the heart of Kluane National Park's Saint-Elias range. It is remote, prone to freezing snowstorms and, due to active tectonic uplift, is getting gradually higher every year. Last year, The Royal Canadian Geographical Society awarded an expedition grant to Martinez and Chilean Ines Dussaillant for their plan to ascend the mountain together in alpine style (which focuses on speed and self-sufficiency) via the demanding and technical East Ridge route. Featuring two knife-edge ridges and a high level of exposure, the route had never been conquered by an all-women team. Bad weather forced the duo to delay the expedition and Martinez eventually decided to go it alone this year. Martinez began her climb on April 22. Within a few days, her progress was hampered by a broken crampon and finicky stove. But the real trouble started the morning of May 1 as she slept at an elevation of nearly 4,000 metres, high above the clouds. According to an update posted to her expedition log, she was awoken at 5:30 a.m. by a tremendous roar, and felt the glacier under her shake and move. Once out of her tent, she saw massive serac avalanches all around. A serac is a giant, precarious block or column of ice formed among glacier crevasses. About two hours later, the ground shook again, but Martinez remained unharmed. She has since relocated her camp to a relatively stable and protected ridge, but is regularly digging out her tent while she awaits rescue. "Martinez is very experienced and was prepared for bad weather," Mike Schmidt, the chair of The Royal Canadian Geographical Society's expeditions committee, said via phone from the Kluane Lake Research Station. 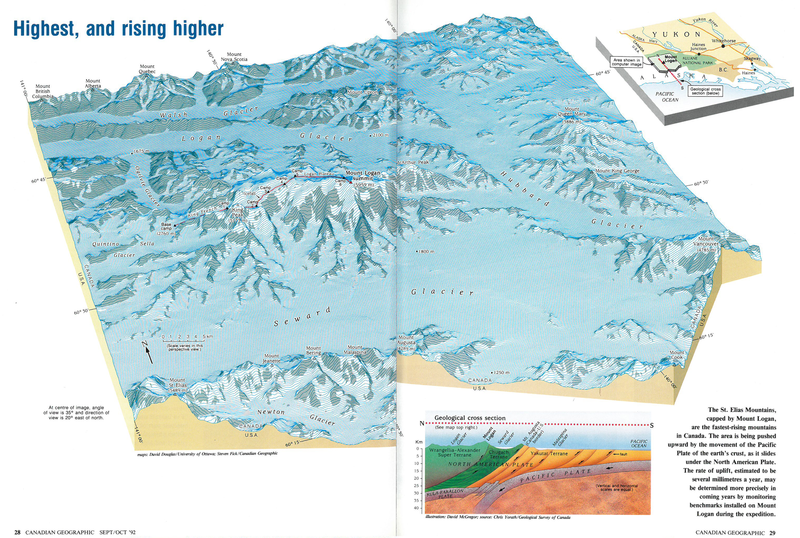 In 1992 Schmidt led the RCGS team that confirmed the height of Mount Logan using GPS. "We're supporting her and right now hoping she can get off the mountain safely." 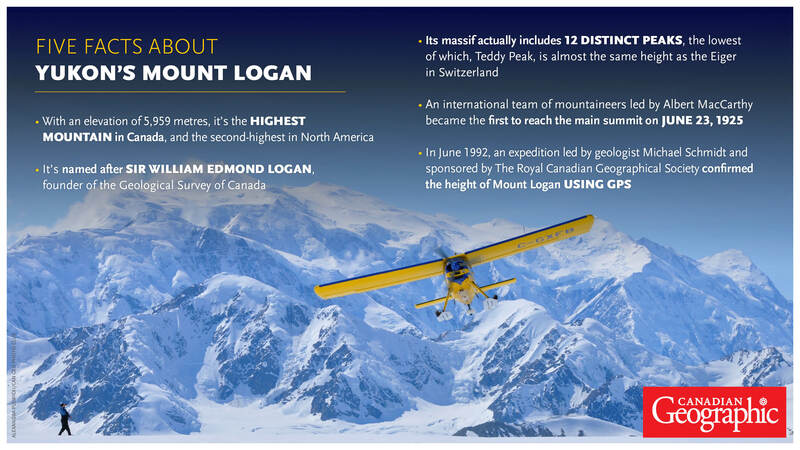 James Coleridge, an experienced mountaineer who summited Logan under the banner of the RCGS in 2008, said the mountain is one of the most beautiful in the world, but also unpredictable and frequently punishing. Hurricane-force winds and blinding snow at 4,700 metres forced Coleridge and his climbing partner, Len Vanderstar, to hunker down in an ice cave for several days, during which time their only thoughts were of how they would survive another day. "Anytime you’re up that high, your life’s on a fine line," he said. "You dig in, you count every gram of food, and you hold on for dear life." Martinez's partner, Camilo Rada, has been keeping in touch with her by satellite phone. "She's a really strong woman," he told the CBC, "so she won't give up, and she will stay put there, and strong." 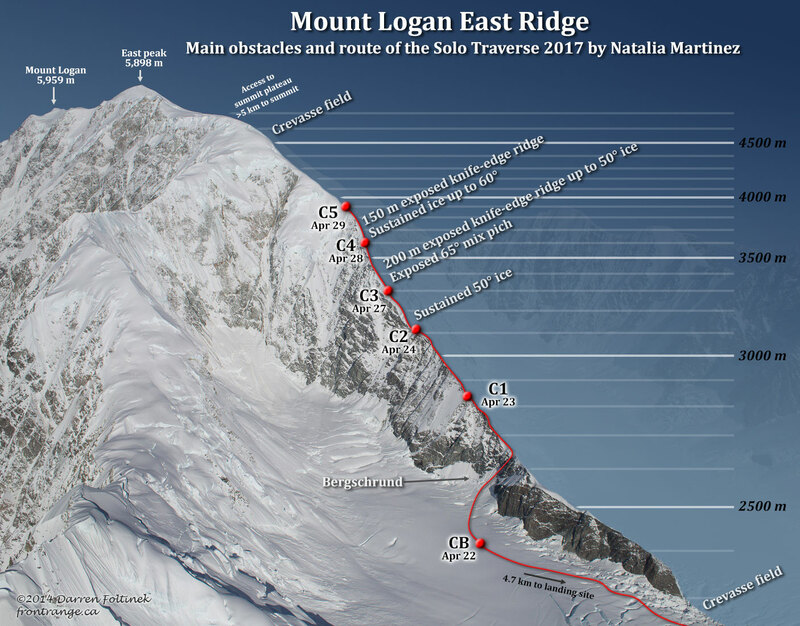 Natalia Martinez had attained nearly 4,000 metres on Mount Logan when earthquakes and weather forced her to abandon her plans for the summit.